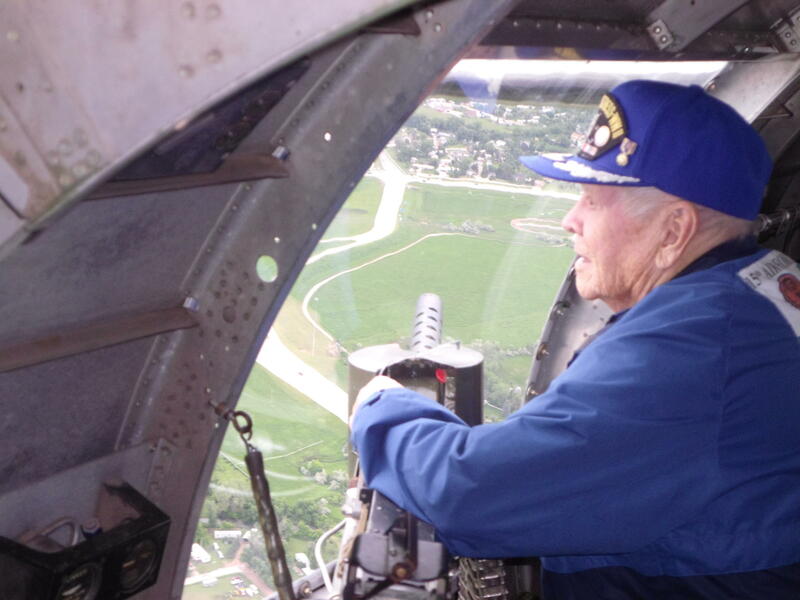 WWII B-17 bomber pilot Chuck Childs looks out a window of the fully restored and fully operational “Sentimental Journey” - at the waist gunner's station - during a special flight over Rapid City. Chuck Childs was a flying instructor for the U.S. Army Air Corps during WWII (September 1, 1939 to September 2, 1945) before he began flying B-17 bombers over Europe. He flew 37 combat missions against Germany and, miraculously, survived them all without serious injury. After the war, Childs took part in the “Berlin Air Drop” (Berlin Air Lift - April 1, 1948 to May 12, 1949) ), flying 196 missions to bring daily necessities to German citizens living behind the newly created Russian Iron Curtain. Aircrews from the U.S. Air Force, British Royal Air Force, Royal Canadian Air Force, Royal Australian Air Force, Royal New Zealand Air Force, and the South African Air Force flew over 200,000 flights to provide Berliners 8,893 tons of fuel and food. Childs also participated in the Korean War, carrying paratroopers into combat. Among other awards, Chuck Childs received 2 Distinguished Flying Crosses. He recently took part in a special flight of the “Sentimental Journey” – a fully restored and fully operational B-17 bomber – over Rapid City. 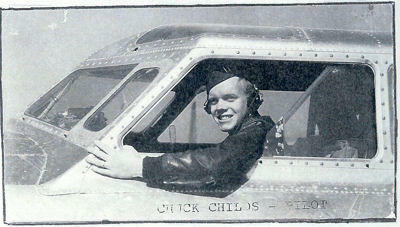 SDPB’s Jim Kent accompanied Chuck Childs on that flight, before which Childs shared memories of his career as a pilot. 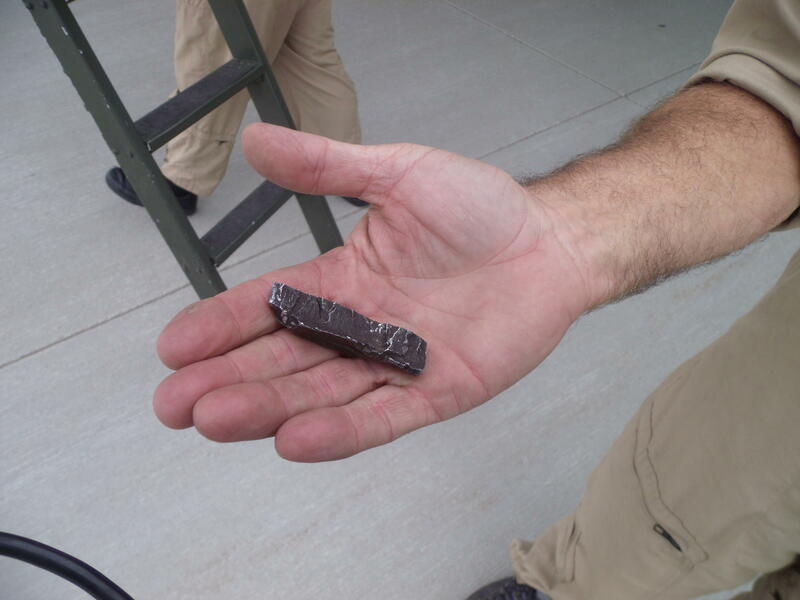 "Sentimental Journey" co-pilot Jim Dennison hold a piece of “flak” (antiaircraft projectile) that entered his father’s B-17 ball turret during a flight in World War II but didn’t injures him. Dennison carries the piece of metal with him on every flight to remember his father and the veterans of WWII. Members of the “Sentimental Journey” crew also offered comments about their own flying experiences and that of family members who fought in WWII. Chuck Childs comments on his personal flying history and B-17 bombers. Chuck Childs comments on boarding a B-17 bomber and how it flies. Chuck Childs in the pilot's seat of “Sentimental Journey” - a B-17 bomber. Chuck Childs in the radio operator's room on the “Sentimental Journey” B-17 bomber. Chuck Childs comments on hearing loss from flying B-17 bombers and his respect for German fighter pilots. “Sentimental Journey” pilot Russ Gilmore comments on his own flying history and B-17 bombers.